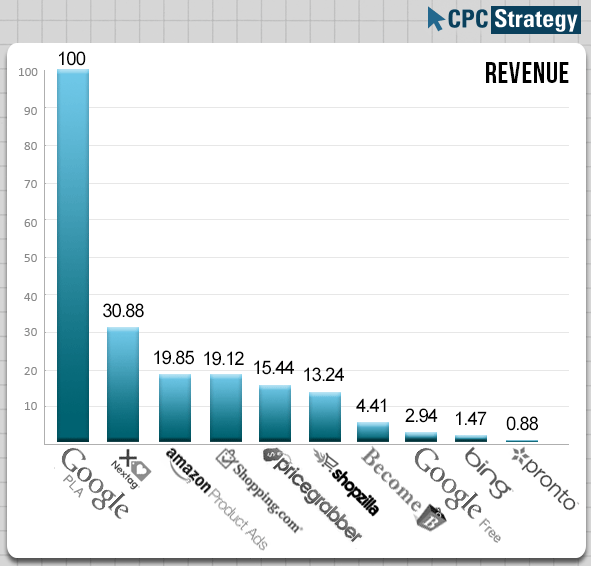 CPC Strategy’s latest Shopping Comparison Engine report shows Google’s grip on the market only tightened in Q2. Across performance metrics, Google PLAs (product listing ads) continue to outperform other CSEs by wide margins. For example, in Q1, Shopping.com, Pricegrabber and Amazon Product Ads all drove roughly half the traffic of Google PLAs. 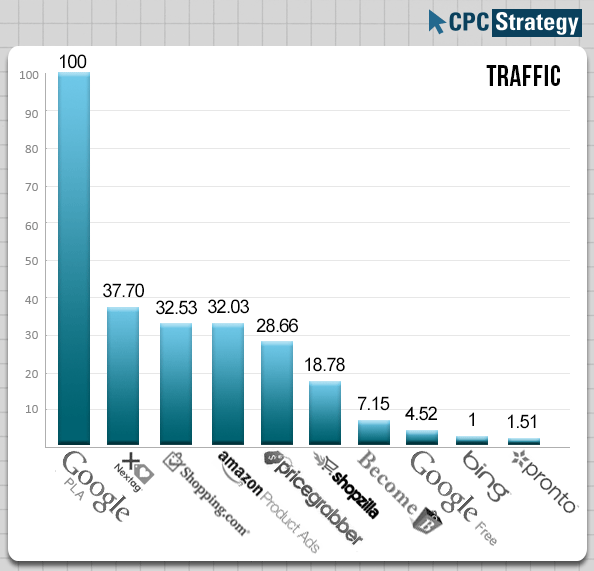 In Q2, the traffic from each of those CSEs fell to less than a third of Google PLAs. “Google appears to really be pushing others out of the market. This is the most one-sided rankings in history,” says Andrew Davis of CPC Strategy. These numbers, based on CPC Strategy’s client set and the company’s management practices aimed at meeting merchants’ ROI targets, reflect the strong draw of Google PLAs. The higher traffic from Google PLA is a direct reflection of the lower cost of sale and higher conversion rates PLAs deliver for CPC Strategy’s clients compared to other engines. Traffic from Google PLA increased 40 percent quarter-over-quarter. Nextag was the only other CSE to pick up a significant amount of traffic this quarter — up 32 percent quarter-over-quarter. Nextag jumped ahead of Shopping.com and Pricegrabber to the number 2 spot. In a telling breakdown, CPC Strategy shares the percent of their clients’ products feeds they send to each CSE. Google is the baseline as the company typically sends merchants’ entire feeds to Google due to high performance. With the exception of Pronto, a much smaller traffic driver, sent fewer products to the other CSEs than they did a year ago. Pricegrabber and Shopzilla, in 2nd and 3rd place respectively, remain attractive because they allow bid changes, often below the “minimum” bids. CPC Strategy says they typically send only merchants’ top performing products to Nextag, Amazon Product Ads and Shopping.com in order to meet their clients’ ROI goals. Google is overwhelming the competition on quality metrics, with the highest revenue and conversion rates and lowest cost of sale than all other CSEs. Nextag replaced Amazon Product Ads in the number 2 spot for revenue this quarter, but that engine’s revenue fell from 38 percent to 31 percent of Google PLA. Amazon Product Ads have seen a dramatic decline compared to Google PLA this quarter. In Q1 this year, Amazon Product Ads traffic was at 52 percent of Google PLA. In Q2, Amazon Product Ads traffic fell to just 32 percent of Google PLA. Amazon Product Ads revenue plummeted from 57 percent to 20 percent of Google PLA traffic. Conversion rates from Amazon Product Ads also fell from 2.7 percent in Q1 to 2.1 percent in Q2, while the cost of sale rose from 15 percent of Google PLA in Q1 to 20 percent in Q2. Unlike most of the other CSEs, including NexTag, Shopping.com and Pricegrabber, Amazon has chosen not to run Google PLA campaigns since Google Shopping switched to a paid model. Amazon’s Product Ads strategy is curious. It’s not clear why the company continues to stay out of Google PLAs, particularly considering it continues to buy traffic through Google Adwords text ads, which typically have higher CPCs than PLAs. Last week Amazon announced minimum bid hikes across 60 Product Ads categories will go into effect toward the end of August.